Though they’re supposed to be the happiest and merriest of seasons, the holidays can feel overwhelming at times. The parties, the gifts, the people and all of the to-dos can make you feel more stressed than blessed this time of year. Thankfully, each of us has a built-in “in case of emergency” rest and restore response, which we can access anywhere and any time. The breath is the only function of the autonomic nervous system that we can consciously control, and by controlling the breath, we can turn off (or turn down) the stress response, slow the heart rate and directly impact our mood. Pranayama has been shown to decrease perceived levels of stress, and the good news is we can use these techniques off the mat for the same “chill pill” effect. Your breath is a barometer for what’s happening with your body, especially your stress levels. 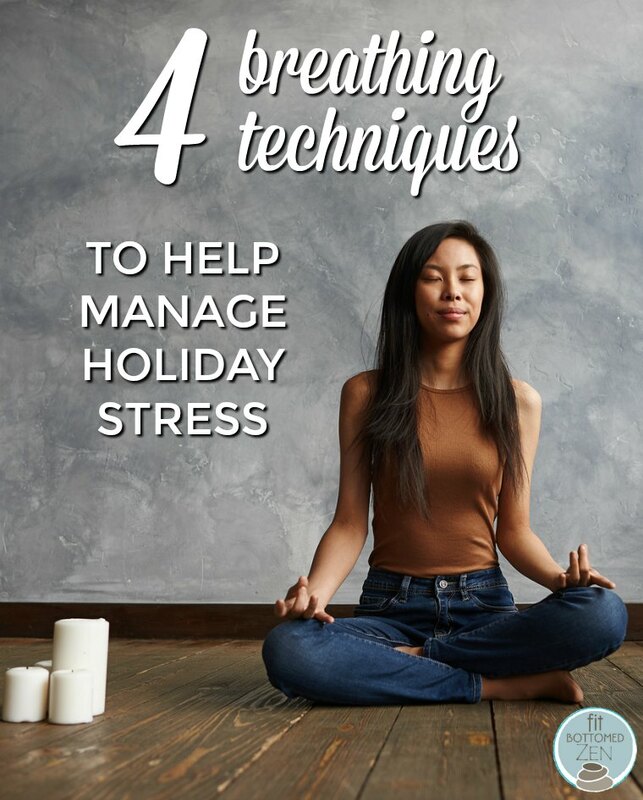 If you can control your breath, you can calm yourself, even during the madness of holiday shopping or a family gathering. Slow breathing, especially with an emphasis on the exhale, works to calm you down by stimulating the vagus nerve. The largest cranial nerve (also known as the “wandering nerve”), the vagus nerve starts in the skull, then meanders through the body, affecting the respiratory, digestive and nervous systems. It is considered our “air-traffic controller,” as this nerve helps regulate all major bodily functions, including breathing. 1. Breath awareness. This is the easiest exercise. Simply start to notice your breath. Doing so may naturally deepen and slow your breath, increasing your sense of calm. Once you start to have a sense of your usual breath pattern and cadence, take three slow, deep breaths. Continue as needed, perhaps adding a silent count that increases with each round. 2. Extended exhale. Since the exhale especially stimulates the vagus nerve, lengthening the exhale can help you mellow even more. Think about how good it feels to sigh! That’s actually calming you down, creating a sense of relief. Take three to five deep breaths. You will start by inhaling for a count of five, then briefly pausing and exhaling for a count of six for the first one. Increase the count each time you exhale, but keep the inhalations the same length. Repeat as needed. 3. Cooling breath. This one will only work if you can curl your tongue, which is based on genetics. (If you can’t roll your tongue, purse your lips into a tight “O.”) Inhale as usual, then roll the tongue up like a straw and exhale through it slowly. Repeat three to five times (or as much as is needed), extending the exhale a bit more each time. This breathing is considered cooling, and you can use it when you start to feel fired up. 4. Bee breath. Bhramari or buzzing breath is one you might want to do alone, as it is audible, but it really works! Inhale as usual, then put the teeth close together to make a buzzing sound and vibration on your exhale. Draw out the exhale as long as possible, and repeat three to five times. You might feel silly, but the natural vibrations and emphasis on the exhale are natural relaxants! Don’t let the holidays become harried instead of happy. Use these breathing exercises to help you stay calm, cool and collected all season long!